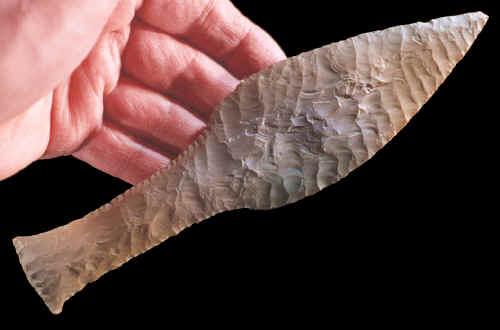 This is a fairly typical example of a Type V Danish Late Neolithic flint dagger. This type signifies the termination of the Neolithic period, though one additional type (VI) follows in the Early Bronze age. After that, the use of flint in Denmark decreases drastically. The Type V dagger is similar in outline to the Type IV, except that much more variation is noted in the handle shape. Also, there is no zig-zag seam running down the length of the handle. The handle does have a flared base similar to the Type IV, but neither the retouch nor the flaking of the body of the handle is as tightly structured as with the Type IV. Furthermore, the very base itself may be either squared or not (i.e. with two edges or one). The examples here shows the more common, squared type base. The blade varies less from the type IV than the handle does, both in outline and flaking quality. While both percussion and pressure finishing are observed, pressure, such as on this example, usually predominates. One encounters less of the straight-in pressure flaking style so common on the Type IV and more of the diagonal varieties common on the other dagger types. This particular blade is fairly well flaked, especially considering its width. The overall size is fairly typical of the type being somewhat smaller than the Type IV. The warm-hued patina on this example shows that this piece was probably recovered from a bog and may therefore have been an offering. Usually only bog finds reflect such warm colors due to infiltration of the iron oxides in the bogs.